Supplier diversity helps direct corporate procurement to businesses owned by historically marginalized communities. This practice supports economic development and access to contracting opportunities for women, LGBT communities and communities of color, and is particularly important for entrepreneurs of color. General Order 156 requires that utilities submit supplier diversity reports annually. 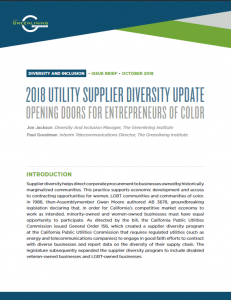 Using these reports, we analyzed the 2017 supplier diversity of 18 utilities across the telecommunications (cable and telephone), energy, water and wireless industries. Overall, the percentage of procurement from diverse businesses remained virtually unchanged from outcomes reported last year in our Supplier Diversity Report Card. But a few stand-out companies achieved relatively high spending with diverse businesses.